EVENT SUMMARY – Thames Valley Berkshire arrives in London. Held in London, MIPIM UK is the 1st UK property trade show gathering all professionals looking to close deals in the UK property market: investors, developers, local authorities, occupiers, corporate end-users, hotel groups, agents and business service providers. MIPIM UK works closely in partnership with a distinguished Advisory Committee comprised of leading industry professionals. Following the success of the Thames Valley Property Forum, Thames Valley Berkshire LEP, Reading CIC, Slough Borough Council and The Royal Borough of Windsor and Maidenhead, supported by Barton Willmore, Development Securities, Haslams and RCVP have teamed together and created a stand under the banner of Thames Valley Berkshire. This unique conglomeration of public/private sector will promote and generate interest in the Thames Valley and the various projects which are being developed across the region, recognised as one of the most successful in the UK. 17:30-19:00 MIPIM UK Awards Ceremony, Open to all. As the debate on the future of aviation in the UK crystallises, what are the implications for the Thames Valley’s global connectivity? A key note presentation will be given by Nigel Milton, Director of Policy and Political Relations at Heathrow, followed by a stimulating Q&A session with an expert panel comprising: Jamie Renison, Senior Director DTZ; Ruth Bagley, Thames Valley Berkshire LEP ‘Western Rail Access to Heathrow (WRAtH)’ lead & Kim Cohen, Partner, Barton Willmore. • Thames Valley Berkshire is the best performing Local Enterprise Partnership area when ranked on ten key indicators of economic success and wellbeing. On the doorstep of London and less than an hour from Heathrow Airport, the world’s business airport. Southern Rail Access to Heathrow, Crossrail and improvements to the M4 motorway) over next five years will further reduce travel times to London and Heathrow. Good rail and road links across the sub-region (14 minutes from London to Slough and25 minutes to Reading by train). Thames Valley Berkshire has consistently been one of the UK’s top locations for inward investment. 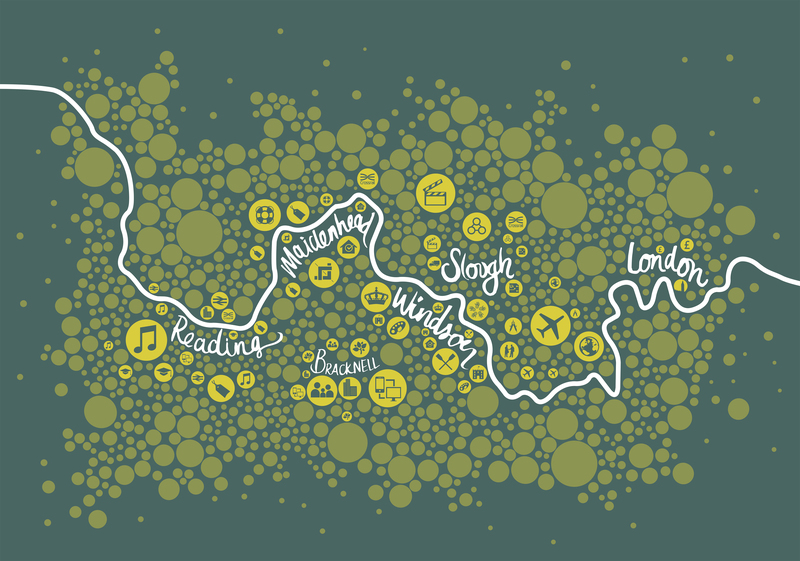 There are over 200 European or global HQ operations in Thames Valley Berkshire. The region is home to the UK headquarters of some of the world’s largest companies, including Microsoft, Oracle, Vodafone, Adobe and Telefonica. A high proportion of Thames Valley Berkshire firms are ‘fast growing’ in employment terms. Thames Valley Berkshire has the highest proportion of small businesses significantly increasing their turnover over a three year period of all sub-regional areas. A vibrant population of over 40,000 SMEs. Thames Valley Berkshire has high concentration of firms and employment in the following sectors: Telecommunications; PC and IT hardware; Software; Pharmaceuticals and Healthcare; Energy and Financial and Business Services. Thames Valley Berkshire has the 2nd highest business start-up rate outside London. Thames Valley Berkshire has the 5th highest rate of patents per residents of all Local Enterprise Partnership areas. A talented and well-educated workforce, with 43% residents educated to degree level or above. A large pool of individuals with specialist IT skills. • Economic growth and business expansion are fuelling an increasing number of business relocations across the Thames Valley region. There are excellent schools across the sub-region. Slough and Reading are in the top 10 local authorities in England for GCSE and A-level results respectively. In addition to attractions such as Windsor Castle and Legoland, the racecourses at Ascot and Newbury provide excellent venues for corporate events. 2nd highest density of SMEs in the UK behind London. Knowledge-intensive business services make up 40% of central Reading businesses and tech businesses are heavily represented on local business parks.